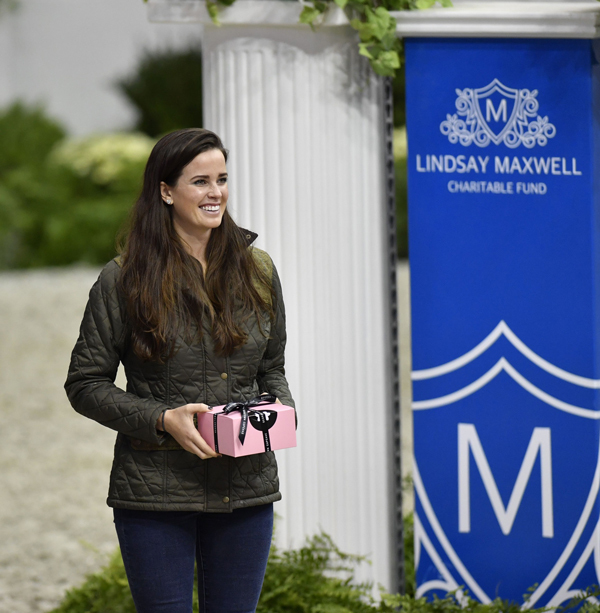 The Lindsay Maxwell Charitable Fund WIHS Equitation Finals and the WIHS Pony Equitation Finals are highlights of WIHS show week for junior riders, and a proving ground for future grand prix and Olympic riders. See current WIHS Equitation Standings. The Lindsay Maxwell Charitable Fund WIHS Equitation Grant provides a rider(s) with the opportunity to participate in the Lindsay Maxwell Charitable Fund WIHS Equitation Finals in Washington, D.C., without the financial commitment that accompanies the event. The grant assists deserving riders with the support to attend WIHS and also guarantees that rider a once-in-a-lifetime opportunity. The grant is experience-based and is not strictly monetary in nature. A key component of the Fund's mission is to positively impact the lives of young people by providing access to special opportunities. Follow this link for the LMCF Grant Application. 40 riders will be invited to compete in the finals based on points earned in the WIHS Equitation classes held during the qualifying period (30 riders will be invited from the East Coast League and 10 from the West Coast League). 25 riders will be invited to compete in the WIHS Pony Equitation Finals. The qualifying period runs from shows starting on or after Sept. 1, 2018, through shows starting on or before Aug. 31, 2019. See list of upcoming shows. More than 600 shows across the US hold qualifying events, including Devon, Upperville, Tryon, Old Salem, Blenheim, GLEF and WEF. WIHS Equitation competitors must be WIHS members in order for points to count toward the Finals. Sign up now! Eligibility: Invitations will be extended to the top 40 junior riders who are eligible to compete based on their points earned during the qualifying period in the East Coast and West Coast Leagues as follows: 30 riders will be invited from the East Coast League and 10 riders will be invited from the West Coast League. Letters of invitation will be mailed in September. The same horse must be used in all phases of the class. No exceptions will be made. Riders competing in the WIHS Equitation Finals may not compete in the WIHS Pony Equitation Finals. Format: The class will be conducted as a two-phase competition (a hunter course and a jumper course) followed by a final work-off. Horses to jump 3'6" in hunter and jumper phases. The order for the first round will be drawn. The order of go for the Jumper Phase will be in reverse standing order of the Hunter Phase with the winner of the Hunter Phase competing last. See detailed Procedures for WIHS Equitation Finals. Eligibility: Invitations will be extended to the top 25 junior riders who are eligible to compete based on their points earned during the qualifying period. Letters of invitation will be mailed in September. Format: Ponies to jump 2'3" (small), 2'6" (medium) and 3'0" (large). The same pony must be used throughout the class. Each pony may be ridden by one rider only, unless the judges request a change. Conventional tack per USEF rules. Riders competing in the WIHS Pony Equitation Finals may not compete in the WIHS Equitation Finals. This class will be conducted as a one-phase competition and a work-off. Diane Kaminski, Ryegate Show Services, Inc.
For additional information, visit WIHS Equitation and Championships.